Due to public demand and questions from readers. We have finally added this unique application in our blog. 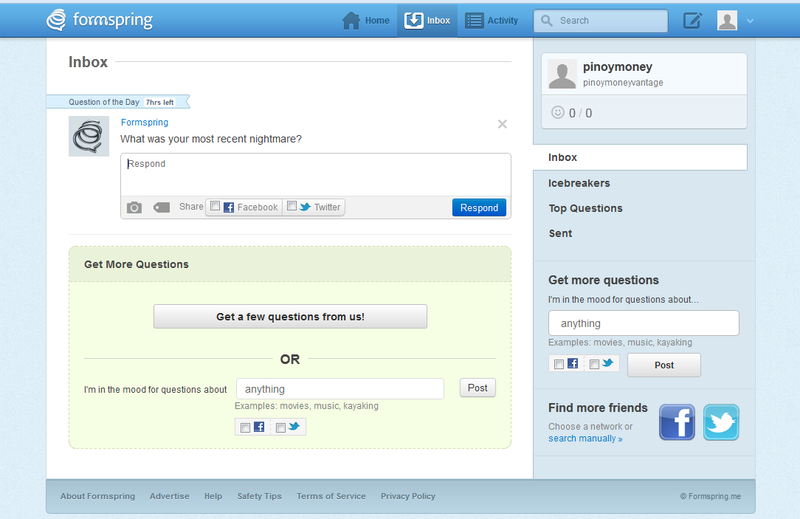 According to Wikipedia, Formspring is an interest-based social Q&A website, launched in November 2009, and created to allow users to relate their ideas and opinions on any topic. Formspring is easy to use and has features that you can use including sharing your Question and Answer segments in your personal Facebook or Twitter. Membership and registration on this site is free. Come and visit our Money Matters Question and Answer on money, personal finance, investments and others and I'll try to answer them ASAP. Visit my Money Matters Question and Answer page by clicking this link.